Although the Second World War was announced as over in 1945 its effects lasted well into the 1950s, and especially affected 1950s Fashion . Money and materials were still in short supply, and efforts were concentrated on priorities like clearing bomb sites and trying to get a devastated Britain back to normal, not fashion. But still, part of feeling normal for many British women was in looking fashionable, and despite disapproval from some quarters by the end of the 1940s versions of French styles which cocked a snook at things like fabric shortages, practicality, or a woman’s ability to work were increasingly being seen in Britain. Most women who had worked during the war were fired to make way for returning men, and found themselves housewives once more. Some preferred not to work outside the home and enjoyed the new 1950s fashionable confections which were definitely not designed for manual labour. They said they felt dainty again. Others were more ambivalent. 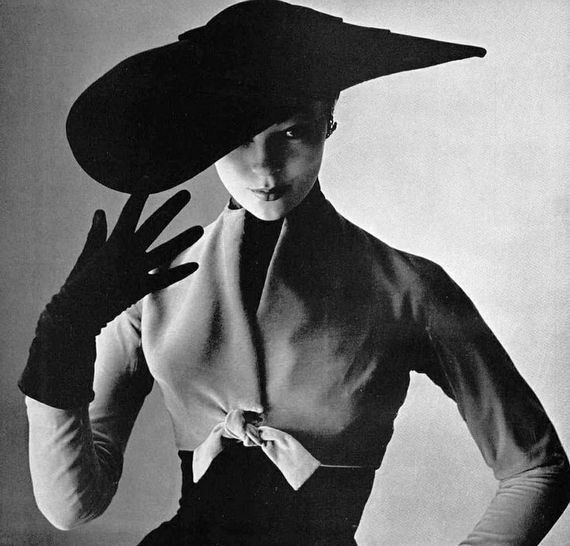 The predominant silhouette made famous by Christian Dior but also seen in other French collections, had a tiny waist, fitted top half with pointed breasts, and a full skirt to just below the knee. Dior called it his Corolla collection (likening a woman in his skirts to the dainty corolla of a flowers petals). 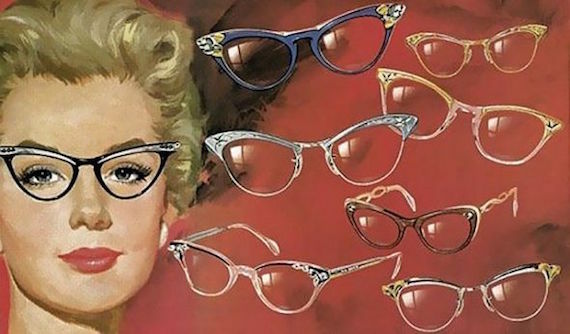 It was most famously known as “The New Look”, and was to become a style that dominated 1950s fashion . Teenagers, first in America and then elsewhere, began to break away from their mother’s stiff styling and develop their own rockabilly or beatnik styles. In Britain, the scandalous Duke and Duchess of Windsor, the ex-King Edward and Wallis Simpson, despite their shocking status (the King had renounced his throne in order to married the divorcee) were both considered the epitome of style. “My husband gave up everything for me… I’m not a beautiful woman. I’m nothing to look at, so the only thing I can do is dress better than anyone else. “If everyone looks at me when I enter a room, my husband can feel proud of me. That’s my chief responsibility.” said Wallis Simpson at the time. 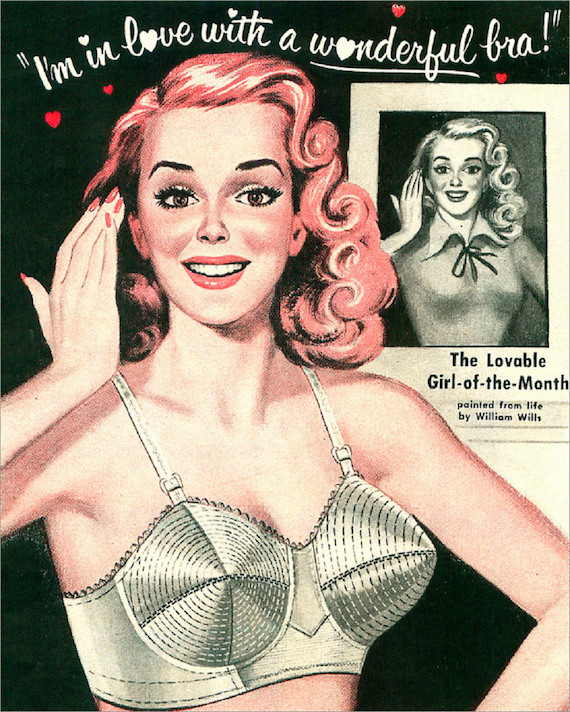 Underpinnings were a really important part of the 1950s fashionable woman’s outfit in womens wear. Whether the skirt was full or slender, if it was a dress she was wearing or a skirt suit, or even a youthful sweater girl look, it all started with a nipped in waist and rounded hips, achieved with a “waspie” girdle, and the pointiest bra seen in history. 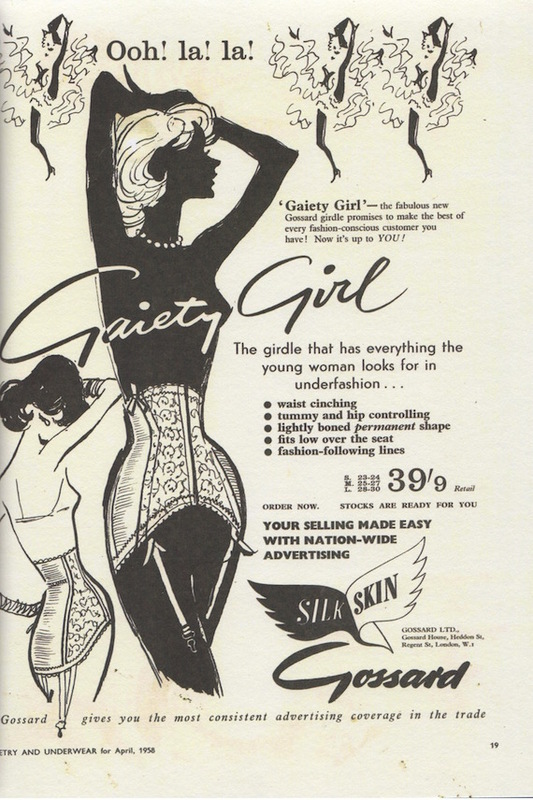 The girdle had stocking suspenders attached. Tights were not to become popular until the 1960s. In between were worn knickers. All of these were made in the new improved easy-care and affordable man-made fabrics like nylon. For special occasions skirts were held out by crinoline cages or stiff net petticoats, although when worn without they had a soft, draped appearance, and hips were sometimes padded too. This is the period where American teens wore “bobby socks” under their stilettos. Wartime Utility clothing had really been helpful in streamlining Britain’s ready to wear clothing industry, and making clothing factories more efficient. The more stripped down styles introduced by necessity during the war remained by choice during peace time, and became perhaps even simpler. Block colours replaced prints for tailored clothing and neatly tailored suits with pencil skirts or fitted dresses along the same lines were most suitable for work and shopping. But for relaxed cotton summer sundresses prints ran riot, with stripes, spots and multi coloured florals in just about any colour combination available. 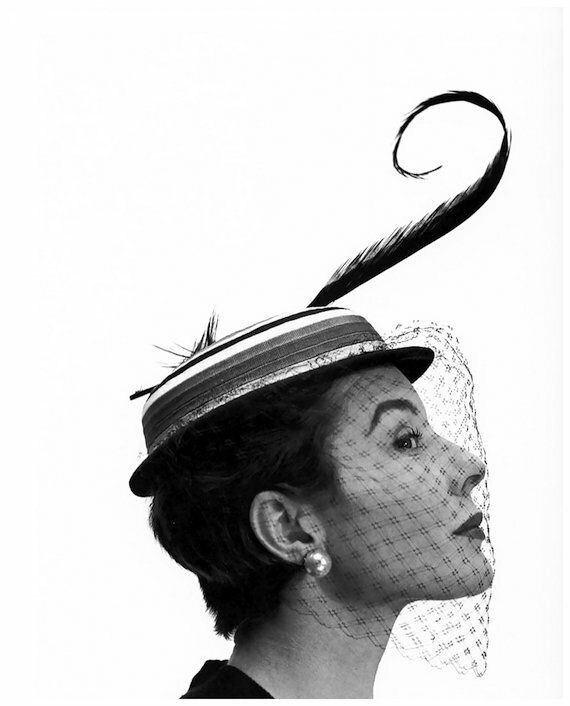 Top French designers of the day included the aforementioned Christian Dior, as well as Jaques Fath, Nina Ricci, Coco Chanel, Pierre Balmain, Hubert de Givenchy and Christobal Balenciaga. 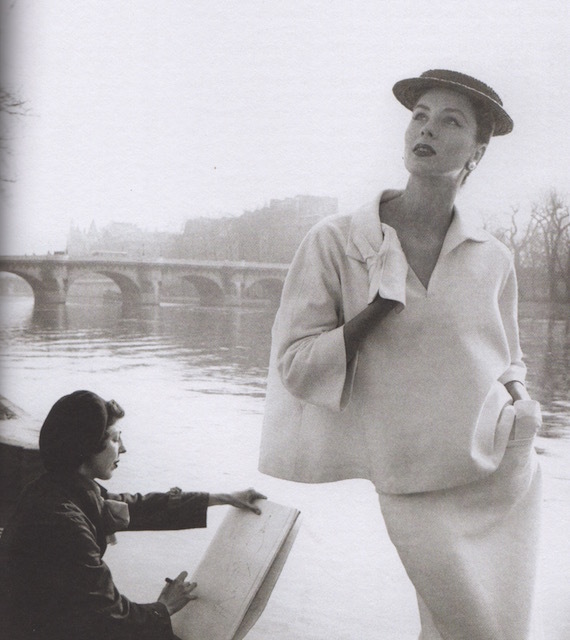 Dior, Fath and Ricci presented variations on the New Look, with a tailored jacket and pencil or full skirt. Givenchy’s clothing was less stuffy, less padded and structured. 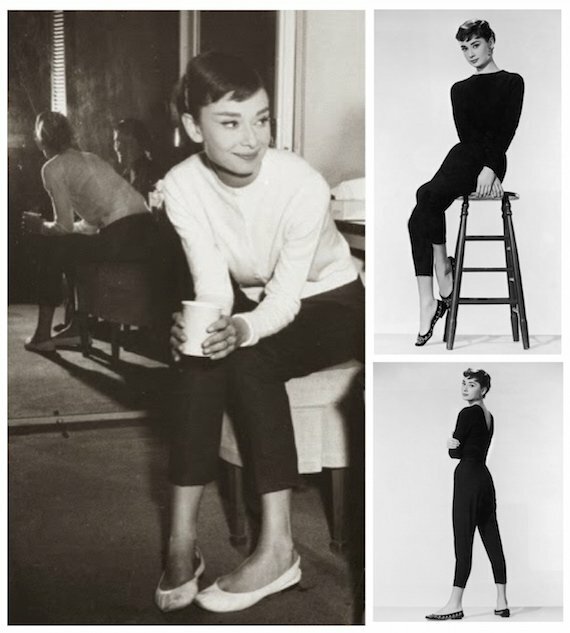 He presented separates that could be mixed and matched and was later to become incredibly famous for dressing Audrey Hepburn in some of her most iconic roles. 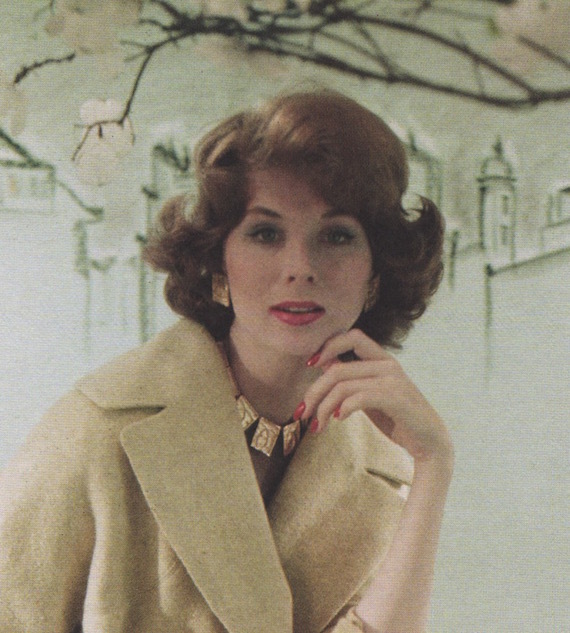 During the 1950s, Chanel chose to stay mainly with her boxy edge-to-edge “cardigan jackets”, in the style which had been so popular since the late 1920s, teamed with a matching straight knee-length skirt. Christobel Balenciaga , a Spanish-born designer who had settled in Paris, went the opposite way to the New Look, creating loose fluid designs and continually experimenting with the silhouette. 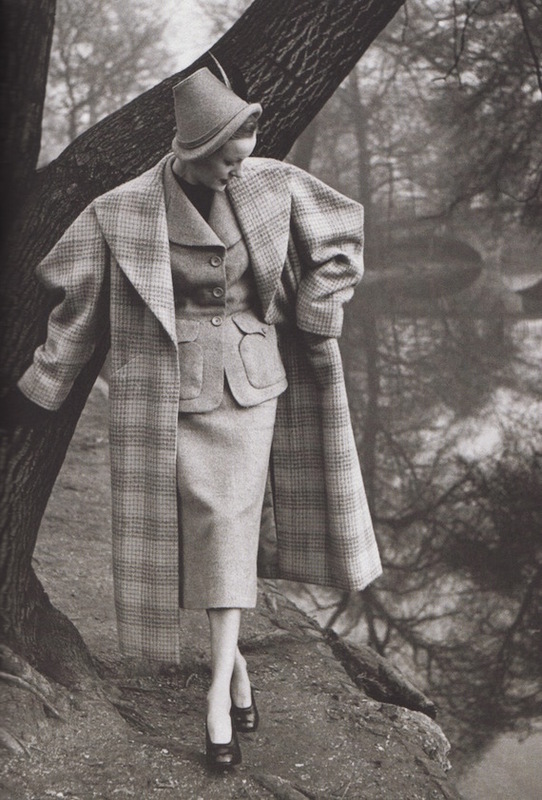 He introduced the balloon jacket in 1953, and in 1955 it was the tunic dress. In 1957 he changed direction and showed the high-waited babydoll dress. His cocoon coat is a classic shape that has been returned to in recent years. London had its own small but growing design scene, mostly based on tweeds and tailoring rather than Paris’s more elaborate confections. 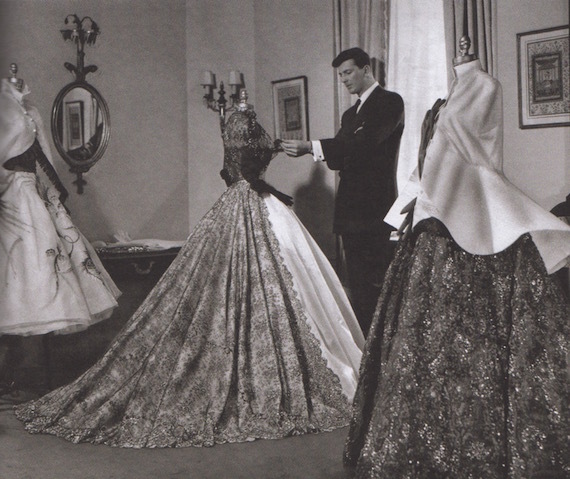 Hardie Amies who trained as a tailor, designed the Princess Elizabeth (soon to be the Queen)’s dresses for a tour of Canada in 1950 and ran a West End couture salon for anyone who wanted a slice of her very conventional and correct kind of understated elegance that as he said “Didn’t frighten the horses”. 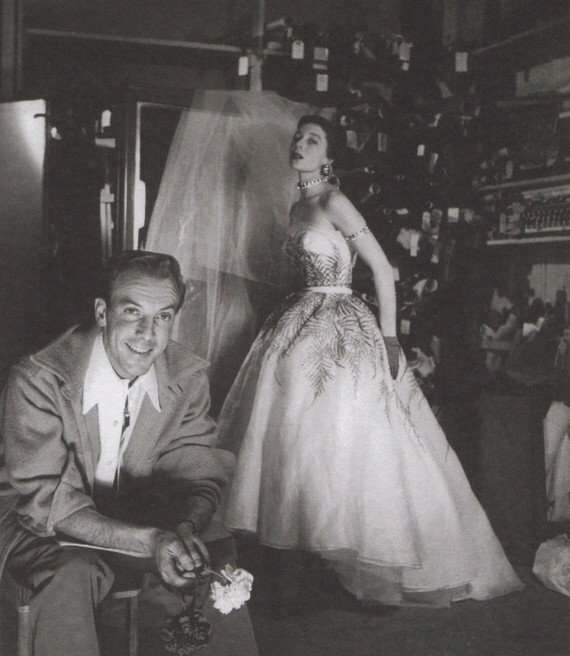 Norman Hartnell, another London couturier, designed her coronation gown in 1953 and went on to design many other outfits for the royal as well as London society, and Digby Morton continued his wartime success in producing pared down tailoring inspired by menswear. America, which had not really celebrated its own designers until the Second World War either but looked to see what Paris was doing, now had a distinct style of its own, following general trends but with its own signature stamp. 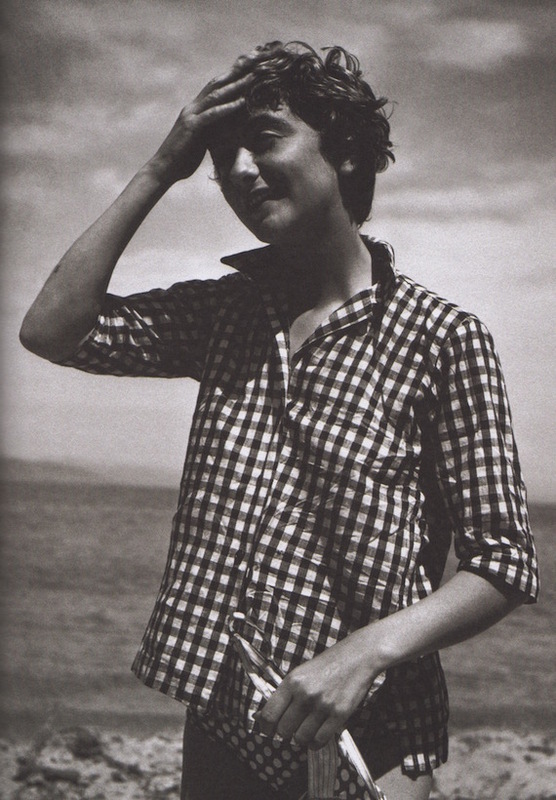 American designers, like Claire McCardell made clothes that were generally more practical and comfortable, though American clothes were often considered loud and brash by English visitors at the time. American teen bobbysoxers (and the British girls who copied them) wore the classic youthful ponytail, cool French gamines favoured a short soft crop, and a deep fringe was worn by some, but ladies stuck to elegant but stiff structured waves off the face. Hair could be loose and neck to chin length, or if longer gathered usually in a bun at the back of the head, but always carefully arranged. Times were changing, and it was no longer shocking to be seen out on the street without a hat and gloves on. But a formally dressed lady still wore short white cotton gloves for daytime, and a decorative hat. Hats were really creative, and not necessarily designed to provide winder warmth or summer shade, but more as a finishing touch. The large shallow pyramid of the “coolie” straw hat was popular, as were small straw boaters. Smaller hats tended to be set right in the centre of the head, covering the top of the forehead but not any further, and not tilted at an angle. Kerchiefs over the head were a more casual look, as were berets. Sunglasses had been popular since the 1930s, but were now becoming really widespread, with women wearing them not just to protect their eyes from the sun but to look cool too. The cat’s eye shape was universal, on both sunglasses and eye glasses. 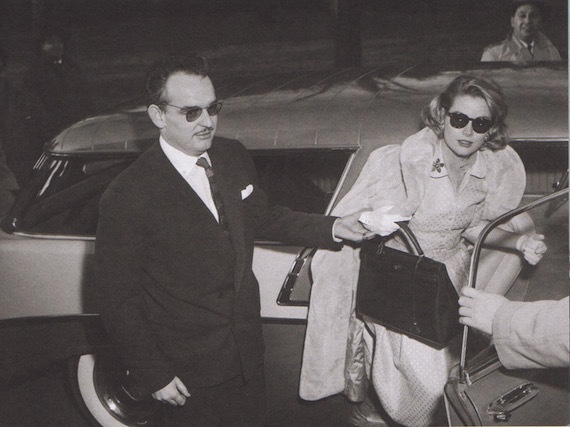 The still popular Kelly handbag by Hermes was used in a 1954 film, To Catch a Thief, starring Garce Kelly. 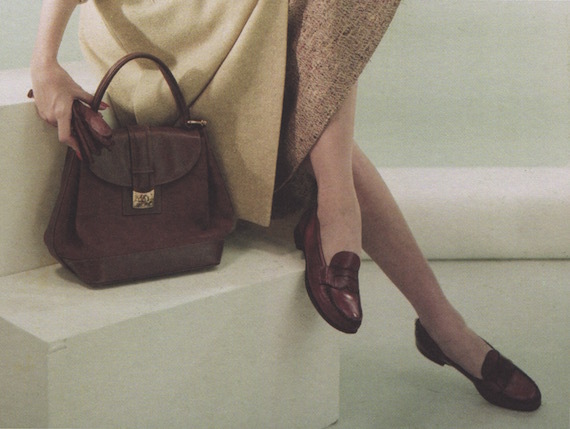 Kelly kept the handbag and was photographed in public with it, which made it ultra popular, although it wasn’t actually re-named the kelly until 1977. The Kelly is a large, structured handbag, worn over the arm. These types of bags and envelope clutches in colours co-ordinating to shoes for evening were popular. The engineering of the stiletto shoe had just been invented in 1950s Fashion, utilising a steel core to created a strong, slender heel, the highest and thinnest possible yet. It was popular when added to a court shoe type shape, alongside more sturdy looking but just as high heel, kitten heels and flat shoes in the form of correspondence shoes, ballet pumps and brogues. 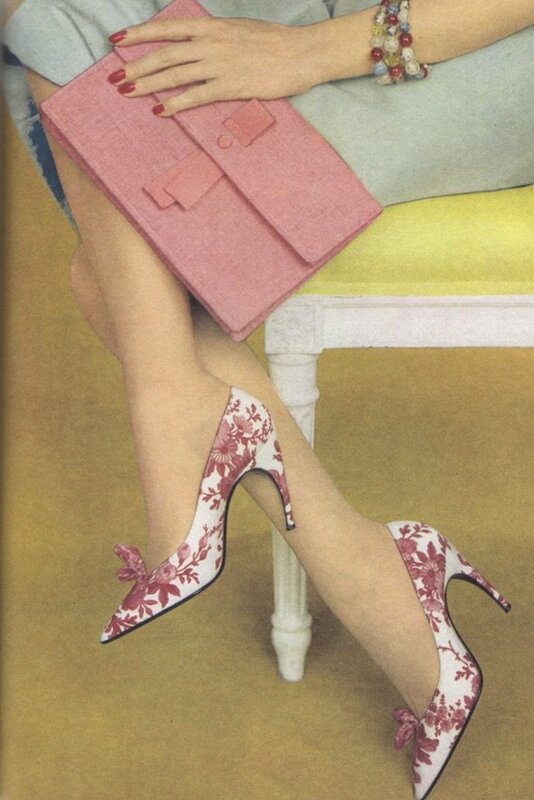 Matching shoe and hand bag colours was the formal way to dress. 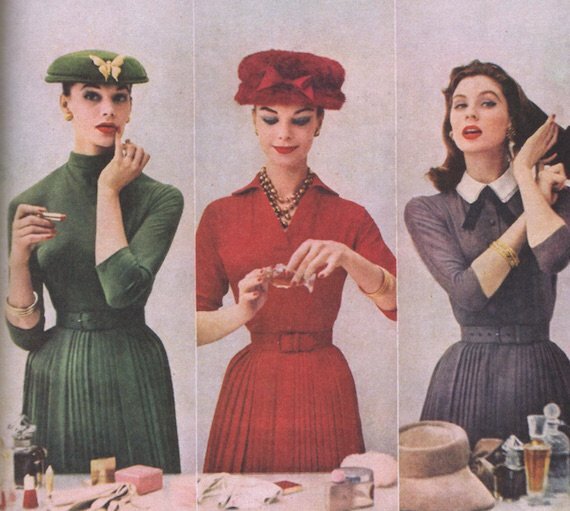 The 1950s fashion for make up was to have matching lips and nails, usually in a shade of red but coral was a relaxed, summer holiday look, and soft pink or sugar pink was for teenagers or the ingenue look. Foundation was quite heavy, meant to be flawless, pink blush faintly emphasised the fashionable high cheekbones, and eyebrows were heavily emphasised. 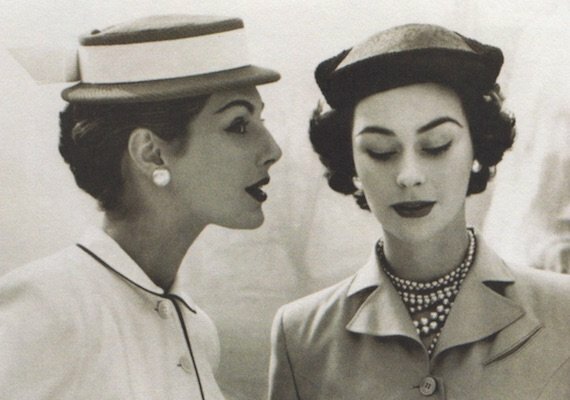 The most immediately recognisable make up look in 1950s fashion, however, is the “cat eye” flick of eyeliner. 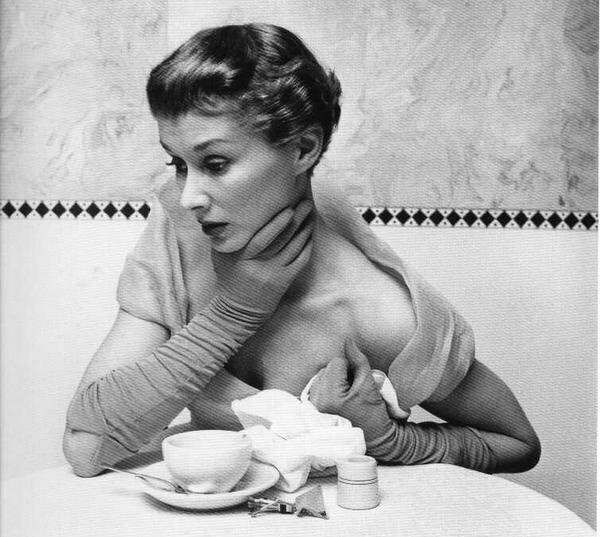 Lighter and fresher perfumes became more popular post-war, and Miss Dior, which had been launched by Christian Dior in 1947 was one of the top sellers. L’Air du Temps by Nina Ricci was released in 1948, and then there was the more affordable Soir de Paris by Bourjois for teenagers. Two other less exclusive perfumes were brought out by the make up brand Max Factor: Hypnotique and Primitif. Finally for those who still preferred a seductive scent, Femme de Rochas, a heavy, sultry perfume created in 1944, was for the femmes fatales. 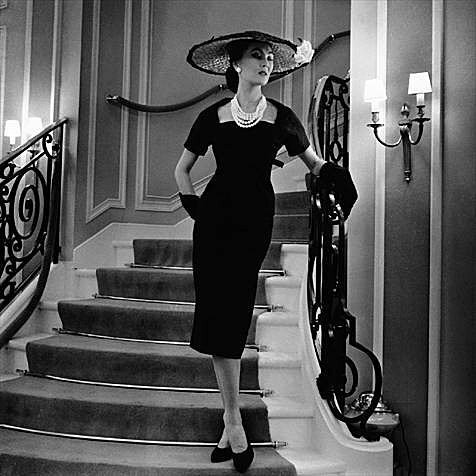 The overriding jewellery look for the elegant 1950s lady was a string, or a double string, of graduated real pearls, designed to fall to the collar-bone. These were matched with large pearl button earrings. Big and bright costume jewellery was acceptable for daytime, and again earring tended to be quite big and round, close to the head and not dangly. Matching sets of bold earrings and necklaces were popular. Brooches were worn on suit lapels. Bracelets and discreet rings were sometimes worn, but on the whole the focus was on the head and neck. The New Look silhouette of course carried through to the evening in 1950s fashion, with the hourglass shape accentuated by slim silk sheath or fit and flare dresses sometimes strapless with a bustier top. They were knee-length for cocktails or down to the ground for formal events. 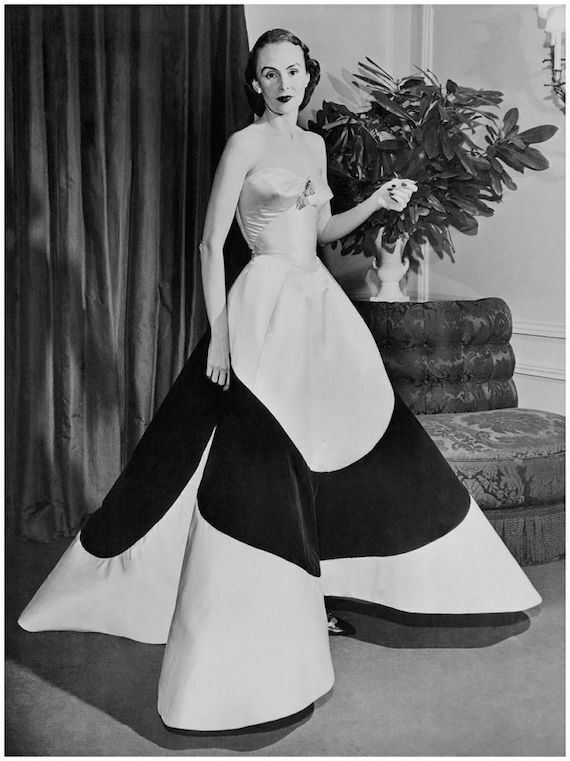 Couturier Charles James created wonderfully inventive structured gowns during this period, such as his “Four Leaf Clover” design. On the other end of the scale in 1950s Fashion, man-made satins were getting better and were used as a much cheaper substitute for real silk. In America, Norman Norell was raising eyebrows with his innovative evening wear that combined “day” fabrics like tweed or cotton with luxurious silk and fur. 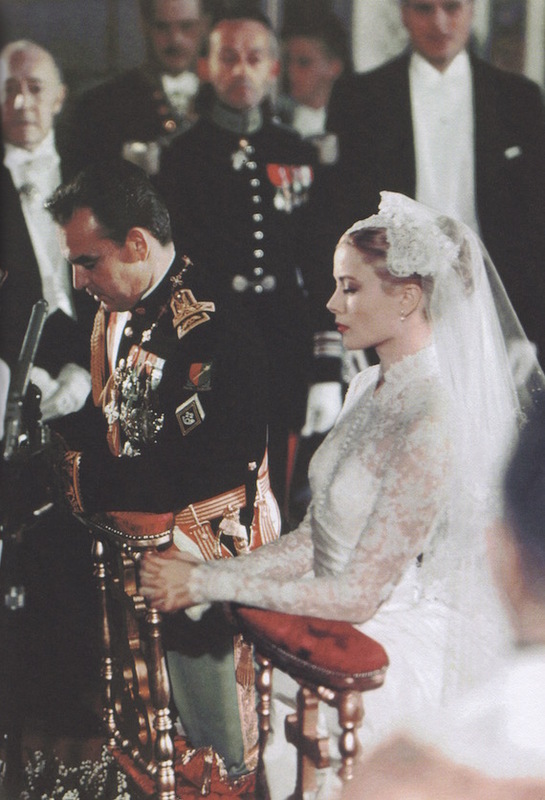 The wedding of the year (or even of the Century, some called it – though Grace Kelly herself called it “The Carnival of the Century”) was that of Grace Kelly and Prince Rainier of Monaco, in 1956. Her dress was made from 25 yards of silk taffeta and used antique rose-point lace and pearls. It had a fitted bodice overlaid with lace to the throat, culminating in a small standing collar and closed with a long centre row of tiny buttons. The long sleeves were also lace, and this combined with the full skirt and sweeping train on Kelly’s tiny frame combined in an effect that was simultaneously modest, elegant, and incredibly romantic. It is a look that has been copied hundreds of times over, perhaps most famously in recent years being used as inspiration for Sarah Burton for Alexander McQueen’s dress for Kate Middleton’s royal wedding dress in 2011. 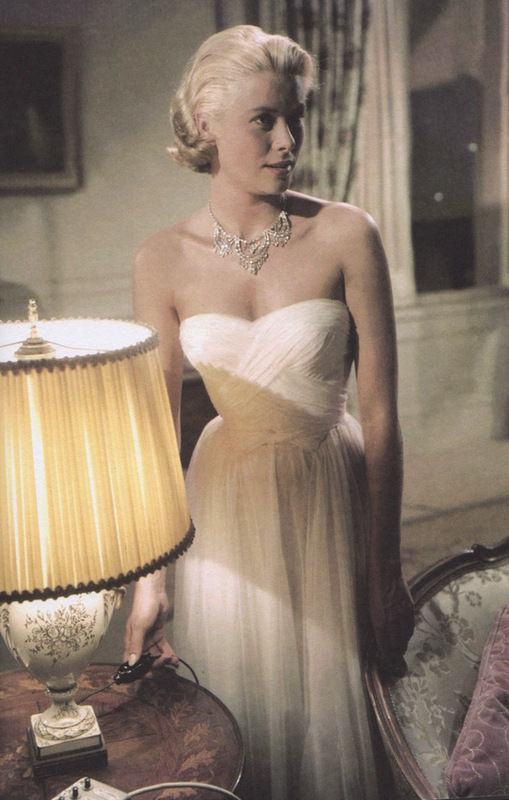 Grace Kelly’s dress was designed by MGM costume designer Helen Rose, and the dress and wedding in Monaco with its many celebrity guests was paid for by the film studio – in return for the whole event being filmed by them. Apparently, Kelly herself would much rather have run off and got married in a simple chapel in the mountains, an idea which her groom, Prince Rainier, laughed off as enchantingly unrealistic. 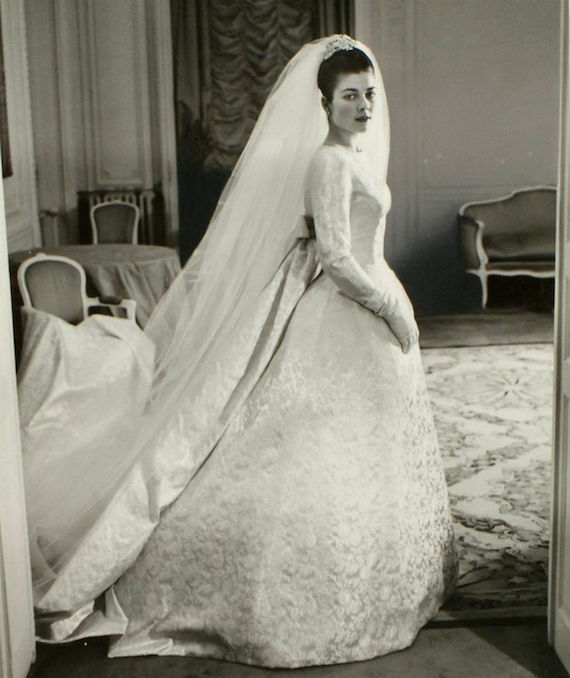 The white silk and lace wedding dress with a full length skirt and fitted bodice, worn with full length white veil was the ideal dress for a bride in the 1950s. Sometimes dresses a little above the ankle are seen, but in reality, the flouncy knee-length dresses now billed as a “1950s wedding dress” is more like a 1950s prom dress but in white. By the 1950s, not all teenagers wanted to dress like smaller versions of their mothers and fathers as they usually had up until now. Some teenage girls still adopted the hourglass shape but went with the “Sweater Girl” look, wearing “casual” sweaters that emphasised their pointy breasts and tiny waists perfectly, but pairing them with slacks, capri pants or full skirts with fun appliqués, held out with layers of net petticoats for a more youthful effect. 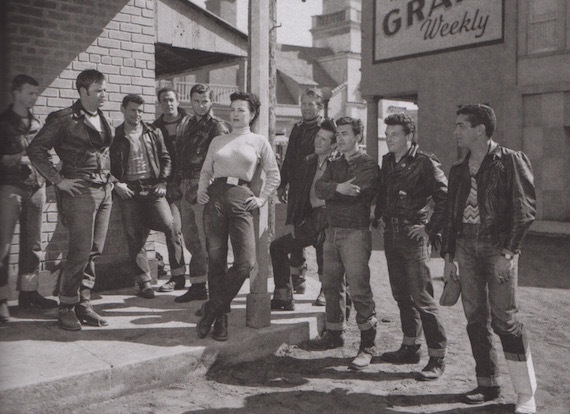 The coolest teenagers of the 1950s womens rejected stiff corsetry and sometimes even bras, wearing capri pants with ballet pumps and little sweaters, or, more androgynously, oversized sweaters or shirts, men’s shoes and trousers, all in black. 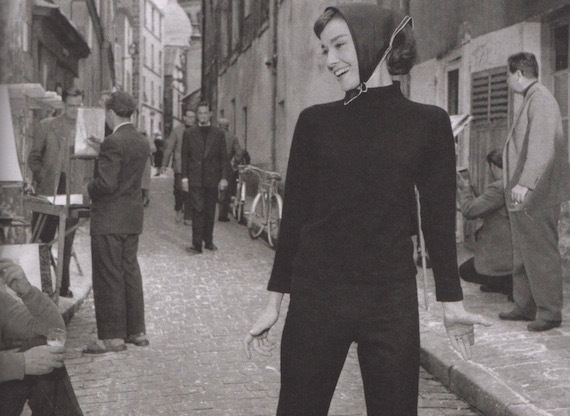 This was the Beatnik or garçonne look. 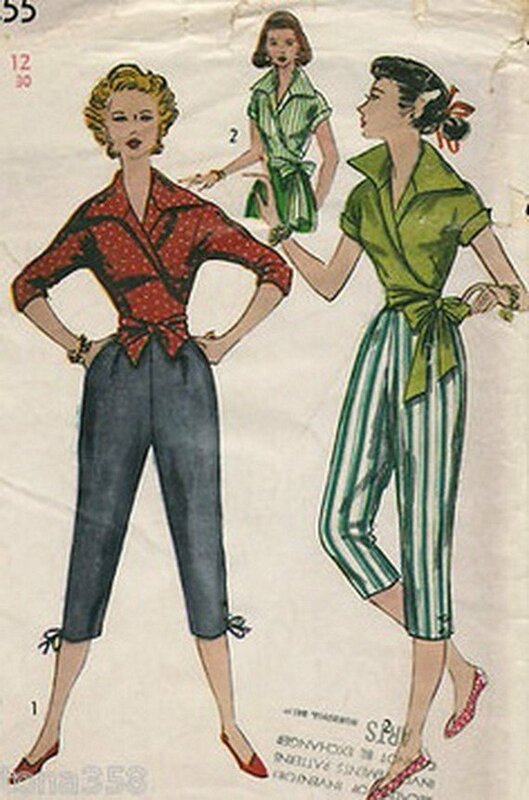 Tight, three-quarter length capri pants showed off delicate ankles and looked modern and young in 1950s Fashion. They were worn much higher up than we wear trousers today, right up to the natural waist which was emphasised with a tight belt. They had a side zip, not a fly opening, and jeans which were coming into fashion for casual wear for 1950s womens wear were the same. They could be quite tight or “boyfriend style” – in fact, just like now, it was cute to borrow your boyfriend’s or husband’s jeans, cinch them with a wide belt, and roll up the ankles. The silver screen star Katherine Hepburn had been wearing comfortable, wide trousers paired with loose men’s shirts on-screen and off since the 1930s, and she continued to influence women with this silhouette in 1950s fashion. However, trousers were for casual occasions only, and for more formal outings dresses were a must. Of course, 1950s fashion is famous in swimwear terms for the bikini. Never mind that the two piece was actually worn since the 1930s, the invention of it was claimed by French engineer Louis Reard in 1946. He announced that he named the garment after Bikini Atoll, which had become the site of a nuclear test that year, as he thought its impact would be just as explosive. Hmm. 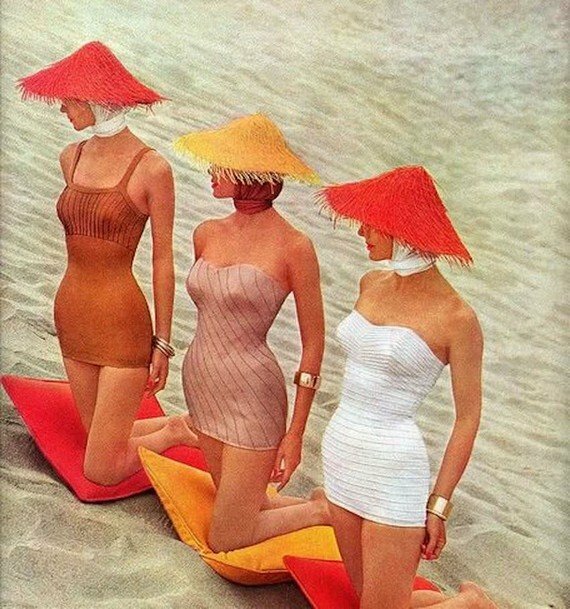 Although many announced that the way that it divided up the body horizontally was ugly, the bikini took off greatly in 1950s fashion womens wear .The one-piece swimming costume was still popular however, and now often featured internal boning to maintain the desired hourglass shape of the time even on the beach. Man made fabrics for swimwear had increasingly good two-way stretch, to better mould themselves to the body, and elasticity to cling even when wet. Wet swim suits also dried more quickly.These properties were also useful for sportswear to make 1950s fashion clothes that were lighter and more flexible, as well as to make every day clothes that dried more quickly with less of a need for ironing.